Eight centuries ago, the continent of Torrezon was a diverse assembly of nations and city-states, enjoying a renaissance of scientific progress, artistic flourishing, and vibrant trade. As war erupted within a remote, mountainous nation, though, the Legion of Dusk was born. Led by deadly vampire conquistadors, the forces of the Legion swept inexorably across the continent. As more and more of the continent came under Legion control, waves of refugees fled from their advance. 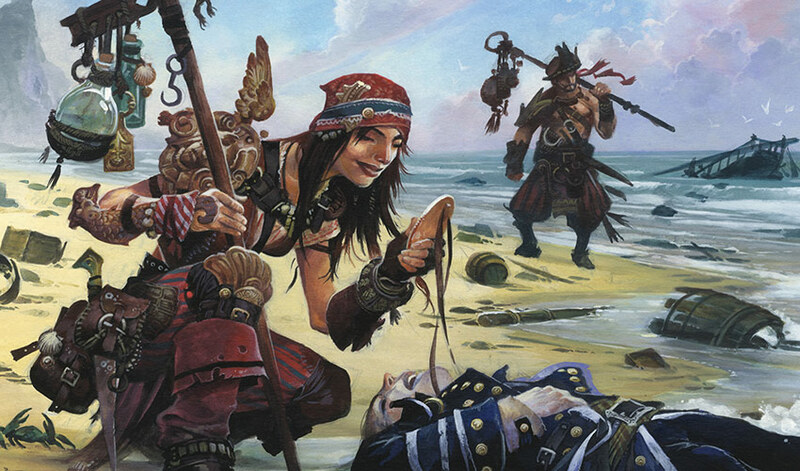 Prosperous merchant sailors from the coastal Free Cities made a daring expedition across the sea to the coast of Ixalan, where they tried to establish trade with the Sun Empire. Rebuffed by the Empire, these merchants turned to piracy. Torrezon now lies entirely under the Legion's control, and Legion colonies exist elsewhere around the world. Now they too have come across the sea and launched their greatest invasion yet as they seek to conquer the Sun Empire, drive out the pirates, and claim the power of the golden city along the way. Though the Legion of Dusk and the mariners who formed the Brazen Coalition are newcomers to the land of Ixalan, their ancient histories are linked with those of the Sun Empire and the River Heralds by the Immortal Sun. Before the Immortal Sun was brought to Ixalan, it was originally put into the care of the people who would become the Legion of Dusk. For generations, the Immortal Sun remained under the protection of its holy custodians in a mountaintop monastery. Though the Immortal Sun became an object of religious reverence, its presence gave the local monarch a disproportionate amount of influence in regional matters. Jealousies blossomed, and the monastery fell under attack by the forces of a rival king, who is remembered by history as Pedron the Wicked. His forces entered the sanctuary, overwhelmed the monks, and seized the Immortal Sun. The last custodian of the precious artifact, a woman named Elenda, was left for dead on the floor of the sanctuary. As Pedron's forces departed, a winged being descended from the sky and took the Immortal Sun from them, carrying the relic to the west, where it was lost. For a time, the people of the region were swept up by an obsession to recover the Immortal Sun, the focal point of their worship. The years went on, but the Immortal Sun remained lost. Obsession turned to blame. The church pointed fingers at the impious, while secular rulers became embroiled in their own political conflicts. The Immortal Sun, once regarded as a physical object of worship, faded into legend as little more than a curiosity. Though the dominion of the Legion's monarchs now stretches across the continent, it was not always so. Eight hundred years ago, a mountainous nation called Torrezon (it later gave its name to the whole continent) split into three parts when its monarch died, with each portion ruled by one of the monarch's children. The two younger brothers marshaled their armies against their older sister, who had inherited the largest portion, in a violent attempt to reunite the sundered realm. The Church of Torrezon was a powerful force within all three kingdoms, and its leaders denounced the rebellious brothers as heretic usurpers, perhaps as part of an effort to increase the church's influence. The two brothers became known as the Apostasine Princes. The armies of Torrezon were soon swept up in a wave of religious fervor, and they waged war against the Apostasine Princes with fanatical devotion. But the collective might of the princes proved greater than even the fanatical army of Torrezon. The war raged on for three centuries, with the children and grandchildren of all three rulers carrying on the conflict. The sheer brutality of the war decimated the population of the entire region. The nobility was diminished and the ranks of knights thinned, but both the rulers of Torrezon and the pontifices of the church refused to admit defeat. In the third century of warfare, the Apostasine armies enjoyed a series of victories, and soon they came within sight of the spires of Torrezon's capital. The remnants of the combined forces of the monarch and the church formed up to meet the overwhelming invading army. Just as defeat seemed certain, a stranger emerged. Wreathed in rippling black vapor, this rider charged into the honor guard of the Apostasine Princes, slaughtering all in her path. The enemy army broke ranks and retreated. The stranger introduced herself as Elenda, who had returned after centuries of seeking the lost relic. The monarch and pontifex were incredulous at such a claim, and Elenda confessed that she took on the blessing of vampirism to continue her search. The pontifex interpreted Elenda's transformation as a selfless act of sacrifice. Soon, many of Torrezon's nobles undertook Elenda's transformative ritual, and it became known as the Rite of Redemption by the church. Torrezon slowly swallowed up kingdom after kingdom, expanding outward from their central mountainous home and driving waves of refugees toward the sea. In the final century or so of Torrezon's expansion, a desperate remnant of the old city-states still inhabited and ruled by living humans clung to their freedom on the southern shores of the continent. They enjoyed a brief period of great prosperity as they developed the seafaring arts and a thriving trade developed among the cities. They established colonies across the scattered islands off the mainland, drawing on the region's abundant natural resources. The arts and invention thrived in an era of prosperity and enlightenment. All too soon, however, the shadow of the Legion of Dusk reached the so-called Free Cities as well. Rather than submitting to their inevitable defeat, though, the daring, indomitable mariners of the Free Cities struck out to make new lives for themselves in a distant land the Legion of Dusk could never reach—or so they hoped. Cherishing freedom above all other goods, these fearless, headstrong adventurers struck out across the ocean to the west, into the unknown. The mariners' skill at sea, combined with the magic and invention that had perfected their small, sleek vessels, helped them navigate the treacherous open waters of the Stormwreck Sea. Even with all their talent and adaptability, many ships were lost in titanic storms, shipwrecked on small islands of jagged rocks, swallowed in great maelstroms, or dragged under the waves by tentacled monsters. Only the hardiest crews survived, battered and nearly beaten, to arrive at the shores of Ixalan. As these vessels reached Ixalan and crews made their way ashore, they were relieved to find the land settled and cultivated by the people of the Sun Empire. They hoped to establish trade, exchanging the treasures they had brought with them for replenished supplies—and the promise of peace. But the Sun Empire rebuffed them, driving them away from the shores and sending them back out to the dangers of the sea. The Church of Dusk has a rigidly hierarchical structure, headed by the Pontifex of Dusk. While Torrezon's church has elaborate ranks of supreme priests and cardinals, only three orders of clergy matter as far as the Legion of Dusk on Ixalan is concerned: the low-ranking deacons who assist the clerics; the clerics themselves, who perform most of the rituals of the church; and the bishops who oversee the clerics. Blood Is Holy. It is the bringer of life. It is the vessel of vitality. It is the reminder of one's mortality. It is the proof of one's lineage. The Sinking Sun. Salvation has a cost. Just as the sun must set to allow for a new dawn, a person can turn to darkness if it will bring about the coming salvation. The Promised Age of Ever-Flowing Blood. The legend of the Immortal Sun ignited a new notion in the church—reclaiming the artifact will bring true eternal life to those who have turned to vampirism, replacing the shadowed but everlasting existence of the undead. Every order of knights and company of conquistadors has at least one embedded member of the clergy. These clerics fulfill a variety of functions: serving as emissaries, tending the wounded, and bringing down the holy wrath of the church. They can be identified by their flowing robes. Vampires sometimes abstain from feasting on blood in a holy sacrament called the Blood Fast. Over time, the fasting vampire's acute hunger actually leads to a state of hyper-awareness. Vampires in this state are utterly terrifying, for with their heightened senses comes a mad fury that the church has declared to be the purest form of pious devotion. The Venerables of the church are its saints—dead vampires who are held up as paragons of church ideals. Devout vampires often call upon the power of a Venerable through the use of relics, which might include a weapon, a piece of armor, a lock of dry hair, a tooth, or even a finger bone that formerly belonged to the Venerable. Some vampire clerics, called Glorifiers, specialize in bestowing the blessings of the church to bolster the pious. Their benedictions can knit grievous injuries and inspire the faithful. They make extensive use of blood in their rituals, often bestowing their blessings through blood poured into ornate chalices. On the battlefield, they can draw strength from blood shed in combat and share that strength among their allies. Condemners wield the power to punish those who do not recognize the righteous authority of the church, imposing the church's full wrath. Their maledictions can wither flesh, summon darkness, corrupt the land, sap spiritual energy, and even extract the blood of their enemies through pores and tear ducts. Some Condemners can inspire crippling fear through the power of their gazes. A specialized order of Condemners, the Shade-Binders, capture and magically bind undead spirits composed of darkness, using blessed braziers that exude inky black smoke. These spirits guard ships when the conquistadors have disembarked, and they are sometimes bound to vampire weapons. The captains of the Free Cities had not fled the Legion of Dusk just to bow to a different empire. Reasserting their fierce independence, they claimed the waters as their domain and turned to piracy and plunder. They embraced a life at sea, with the freedom that accompanied such a life. Each ship became a sovereign power, with the captain as its monarch. Some captains built empires—fleets of ships—united under their charismatic or tyrannical leadership. Like any nation, these ships became contested ground: mutiny could quickly turn a first mate into a captain and a captain into an offering to the monsters of the deep. A ship coveted for its speed might fly one flag in the morning and another on the same evening. A modicum of order came to the pirate ships after a fierce battle between the Scourge, commanded by a young Captain Beckett Brass, and Squid Eyes, guided by its navigator, Jareth Wake. After the Scourge rammed Squid Eyes, the two ships became impossibly entangled. The battle raged on as the crews fought across the decks of both ships, each hoping to claim the ships' boats when the vessels inevitably began their descent to the sea's bottom. But through some quirk of fate, both ships stayed afloat. Eventually, the two captains agreed to a parley, realizing that victory was impossible for either side. Captains Brass and Wake took small parties out on the ships' boats and went in search of new vessels to command, while the rest of their crews stayed behind, at first trying to separate the two vessels but then working together to ensure that they didn't sink. They eventually declared themselves the first citizens of High and Dry—a neutral ground where pirates could meet and trade goods, tools, treasures, and stories. Over time, other derelict vessels limped to High and Dry—or were towed there by more seaworthy vessels—and expanded the dimensions of what soon became a thriving little town. The existence of High and Dry allowed for the creation of an unusual currency among the pirate captains: favors and obligations. Temporary accords and lasting alliances were forged (and broken) amid the listing masts and tilted decks of the floating town, and eventually a web of relationships bound the captains together. Rivalries and feuds persist, of course, but the captains recognize that unity against common foes is more important than any animosity between them, especially now that the Legion of Dusk has reached Ixalan in their wake. 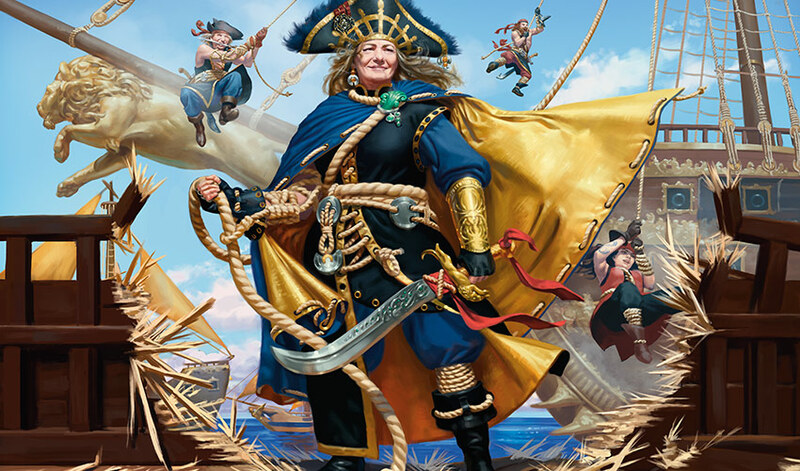 Insofar as a lasting connection exists among the pirates, they refer to themselves as the Brazen Coalition, in honor of Captain Brass, who now commands the largest fleet of the coalition. Beckett Brass, as captain of the Scourge, earned a formidable reputation because of both her skills as a sword fighter (wielding her cutlass, Ripper) and her mastery of enchantment magic. A well-known legend claimed that those who sailed on the Scourge were luckier, faster, and stronger than they were before joining her crew. This was credited to the brass figurehead that graced the bow of her ship, which was said to be infused with the captain's magic to give a boon to any loyal crew member aboard. Thanks to this magic, Captain Brass's crew always found the biggest treasures and raided the most rival ships. Many pirates coveted a position on her crew, and some of them deserted their own captains in hopes of finding the Scourge and winning a post aboard. But if any deserters ever found a place in Captain Brass's crew—or if they ever found the Scourge at all—word never got out. This fact only added to the air of mystery surrounding the captain, her ship, and its magic brass figurehead. Jareth Wake, navigator of a ship called Squid Eyes, became obsessed with discovering the truth. Turning all his expertise to the task of finding her, he designed enchanted compasses, maps, sextants, and calipers, all tuned to a single point: the location of Captain Beckett Brass. He convinced his captain to enable his search by promising that they could plunder Captain Brass's figurehead and perhaps glean some of her magical secrets. But Captain Brass knew when she was being tracked, and she turned to her own trusted navigator and first mate, Lex Briggs. Lex specialized in magically augmenting—and undermining—navigational equipment. Her augmentations could create compasses that would point toward great quantities of gold, maps that would reveal the locations of buried treasure, charts that would show the movement of other vessels at sea, and calipers capable of shortening the distance her crew had to travel to reach their desired location. But her magic could also obfuscate her ship's location, obscure maps, and send compass needles spinning off their axes. At Captain Brass's orders, Lex crafted no fewer than six charms to confound Jareth Wake's magic, and the Scourge would probably have evaded him forever if it hadn't been for Swab, the Scourge's goblin prankster. Swab's trickery disrupted Lex's charms just long enough for Jareth to set his course and discover the Scourge at last. The literal collision of the Scourge and Squid Eyes led to the creation of the floating city of High and Dry and, ultimately, the formation of the Brazen Coalition. Since then, Captain Brass has become Admiral Brass, in command of a disciplined, fearsome collection of ships known as the Fathom Fleet. Ships such as the Hangman's Noose (captained by Sedden Dray), the Witch's Windlass (captained by Farrien Goss), the Windbinder (with its helmsmage-captain Kalishah Abban), and Admiral Brass's own Second Scourge have extended her fearsome reputation. Many captains have proven willing to give up some of their own freedom in exchange for the measure of security that comes from sailing under her flag. Pirates of the Fathom Fleet can be recognized by the rope motifs woven into their clothing, celebrating the metaphorical lines that tie the ships of the fleet—and indeed, the whole Brazen Coalition—together.